Who Wants To Buy Terrelle Pryor's Big Ten Championship Ring? If you want to own Terrelle Pryor's Big Ten championship ring, it's being auctioned off on eBay right now. You only have to beat the current bid of $16,499! This may be the single most famous piece of Ohio State memorabilia available! 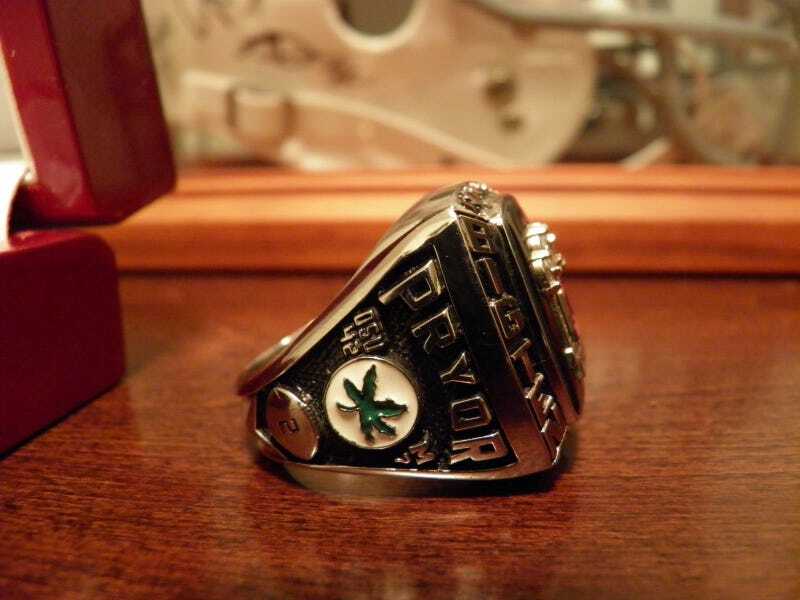 This ring was the start of the Tattoo Scandal involving former Ohio State players Terrelle Pryor, Boom Herron, Devier Posey, Mike Adams, Solomon Thomas, former coach Jim Tressel, and tattoo shop owner Ed Rife. This ring was originally owned by Terrelle Pryor, former quarterback for THE Ohio State Buckeyes and current starting quarterback for the Oakland Raiders. It was given to Edward Rife in exchange for tattoos, although Rife contends that he purchased the ring from Pryor. This exact ring sold on eBay back in early June for $18,100 (see picture). I purchased this ring directly from Edward Rife, the owner of Fine Line Ink Tattoos, who was the primary individual involved in the Ohio State Tattoo Scandal controversy. According to Rife, this ring was the first item that he ever received from Terrelle Pryor... And the rest is history! I purchased several other items from Mr. Rife including signed pants, footballs, gloves, helmets, etc. Seems like a lot for a gaudy reminder of one of the dumbest NCAA scandals, but hey, free shipping!